We are delighted to announce the immediate availability of the DNS 8 Live RC remote control software, which is supplied in the form of an internal web page to which you can connect using any suitable browser. Simply connect it to your Ethernet network by cable or wi-fi, and enter its address into your browser's address bar on a laptop, iPad, smartphone or similar device to obtain a single screen that corresponds to those displayed on the DNS 8 Live itself. 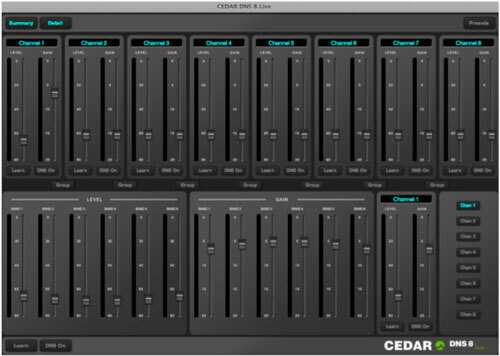 "This is a huge step forward for noise suppression in live venues and environments such as sports stadia", says CEDAR Audio's Sales Director, Clive Osborn. "For example, you can now access all of the DNS 8 Live's parameters when it's installed in a remote truck while you are inside the venue, or even while walking around a stadium. Alternatively, you can use it as a touch-screen controller at your console while the processor itself remains permanently installed in its rack. It couldn't be simpler to use it in these ways, and they add important new levels of flexibility for live sound and broadcast engineers." The DNS 8 Live RC software is compatible with current versions of Chrome, Explorer v9 and higher, Firefox, Opera and Safari. In addition to launching the RC software, we are pleased to announce an improved Learn mode for the DNS 8 Live. Existing units can be upgraded by uploading new firmware via the network. The DNS 8 Live is the first dialogue noise suppressor designed specifically for live and live-to-air use. With eight simultaneous channels of dialogue noise suppression, it hosts a new DNS algorithm boasting a simplified user interface as well as a detailed editing mode that offers more control than any previous dialogue noise suppressor. Offering near-zero latency and featuring a standard 4-pin 12VDC input, it's suitable for use in all live situations - not just live-to-air broadcasting, but also live sound in venues such as theatres, concert halls, conferences venues, and places of worship. The DNS 8 Live RC software is free of additional charge and is immediately available.